Join the discussion on our forums! Come discuss Kaboom Bot over in our dedicated Kaboom Bot discussion topic. I had a good interaction with this. Magnetize it with Zilliax, then use Necrium Vial! You'll get 8 heals! Compared with Spider Bomb this looks absolutely terrible. Sure it's a Neutral, but Spider Bomb's usability is already questionable in the first place. 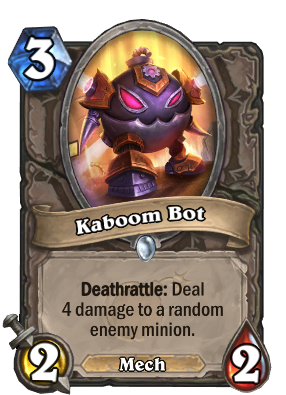 Boombot with +1/+1 that guarantees 4 damage to a minion on its deathrattle. It's okay. Probably better for Arena though. Flamecannon with a 1 mana 2/2 body, which does exist so I guess this is fair and balanced. I can imagine some budget deck running this in their magnetic deck. Maybe it will see SOME play too. I'd argue its a worse Volatile Elemental but I guess its situational. Not a horrible card but it wont be played in constructed. Hunter has Spider Bomb, which is strictly better than this.